Born: 22 May 1927 and died 28 September 2005. Son of: Cmdr John Moore Heath (1891-1944) and Hilary Heath (nee Salter, ?-1984). 1.Gillian Holland (nee Heath, 1930-2009) who married Michael Holland (1926-????). Mark married: Margaret Alice Bragg (born 1931) daughter of Sir Lawrence Bragg and Lady Bragg (Alice Grace Jenny Hopkinson), 25 September 1954 at St James, Piccadilly. 1. Nicholas Heath (born 1956). 2. Clare Staughton (nee Heath, born 1957). 3. William Heath (born 1959). We are all here today in this beautiful Abbey, so beloved of Mark, because he in some way, during his near four score years touched our lives, whether as a relation, a colleague or a friend . As a cousin, but only by marriage, I am very touched to have been asked by Mark's family to speak today. Family was hugely important to Mark and he loved to recall and research his ancestors. Such (ones) were the father and son Charles and James Heath the artists, etchers and printers whose works Mark collected both as pictures which hung in his house, or as books on his shelves. After Marlborough and Queen's College Cambridge, where he read history, Mark enlisted in 1945. He chose to follow in his Father's footsteps and applied to join the Navy. He had no difficulty in being accepted because at the Interview Board in Bristol, a member of the panel made the Commodore Heath connection. " What old Lampey's son " he told his colleagues, and Mark was in! He served three very happy years in mine-sweepers, and retained lasting affection for that Service. Tempted into the Diplomatic Service by his cousin John Heath Mark's first Foreign Office posting took him to Djakarta, and in 1954, while on home leave he married Margaret to whom he had had introductions through family connections. She was the elder daughter of the Nobel Physicist Sir Lawrence Bragg. In fact they nearly never met. While Mark was up at Cambridge Margaret's mother Alice Bragg, tried to invite him on a couple of occasions to her West Road tea parties, put up to it by one of the ubiquitous Hopkinson cousins who was also a friend of Mark's mother. Mark however was too busy, or perhaps chose to refuse. Happily, several years later, Margaret and he were to meet at Oxford where Mark's sister Gillian and Margaret had renewed a Downe House School friendship. The rest is history! They were married at Saint James Church, Piccadilly, and last year they celebrated their Golden Wedding. Mark was rightly proud of their three children and retained a keen interest in their very different careers. His two grandchildren Ziggy and John also gave him real pleasure, as did his step grand-son Jack Staughton. Margaret loved people and chatter and was a wonderful net-worker while Mark would listen and quietly observe. As a sister in law once recalled, "talking to Mark makes one feel so good about oneself "
Mark and Margaret were fortunate to be able to be together throughout almost all Mark's appointments in the Foreign Service. After a spell in Denmark, Sofia was their next destination. This was not an easy placement at the time of the Cold War, living behind the Iron Curtain and that cloak and dagger period of communism under Bulganin and Kruschev. Their flat was bugged and the staff were all thought, or were known to be spies. The only place where they could talk openly was in the bathroom with the taps running full on. But there were lighter moments. Kruschev on a visit to Sofia could not contain his joy at meeting " the big Englishman, "and with their disparity of height grasped Mark in a bear hug round his middle." "You will make a good communist" he declared. Borovitz where in season they could ski, or picnic in orchid-strewn meadows, chase butterflies in improvised nets, and pick bouquets of wild lilac, simple pleasures which Mark so enjoyed wherever he was posted.. When it came to coming home they motored back through Europe. They could not get BG plates for Bulgaria so cut English GB plates in two and reversed them. Arriving at English customs the officer declared "Sir your passport is out of date, you must return to the British Consul in Sofia. "I am the British Consul" said Mark with his customary gentle courtesy and was allowed to pass. That unfailing courtesy which some might now regard as old-fashioned never left Mark and with his passing perhaps one might recall part of Edmund Burke's reflection "The age of chivalry is gone" . . .
men e le pon" he would say, ( actually a stronger expletive unmentionable in this Abbey ) and the caller could be any-one, an insurance salesman, his beloved daughter, or the Pope .On one occasion, with a particularly crackly connection during a luncheon at their house in Arbrook Lane , and several rather cantankerous "Hellos" Mark was heard to tell the unfortunate speaker " well since you are calling from Mexico I can only assume that you have got something important to say !" Mark's next appointment was to Ottawa. There were opportunities to escape with their children to their wood cabin, Scattergood, up in the hills over the river behind Quebec, where carpets of trillium in spring gave way to wild strawberries in summer and raspberries in Autumn and gave untold pleasure. Mark could indulge too in fishing, another happy hobby. Here too the spirit of adventure prompted Mark during a period of leave to drive across Canada with his family, to Banff , and over the borders into the States, hauling a tent-trailer. This was 1967, the summer of love, and the Heaths made their own home movie with an 8mm camera. They were greeted at state borders by cowgirls in thigh-high boots and mini-skirts. A home posting allowed Mark to indulge in both his love of his own garden and of bee-keeping. He was a meticulous and expert apiarist. The life of each hive was carefully documented in Mark's neat hand on post-cards which were kept under the lid of each hive. Honey was potted and labelled Arbrook Honey. But the bees could not be accommodated at his next posting with OECD in Paris. A home for his hives was found with us. Mark arrived one day at dawn with his complete bee equipment, three hives and their occupants in the back of a hired white van. Mark was quite undeterred by the hundreds of escapees that were buzzing around the car and his ears! The vision of him attired in his bee equipment was quite as impressive as in his full ambassadorial rig. Mark would drive the Heath family of 5, three at least of no mean stature, with a competitive zeal round Paris in a mini. That in itself was a remarkable sight. A two-year period as Inspector of Missions took Mark to many of the overseas embassies., where in an effort to prove their careful budgeting Mark was fed on kedgiree, to which in fact he was rather partial . He would recommend a budget cut not withstanding! On one occasion he returned from one of the Scandinavian embassies with a priceless caricature of "Mark the Knife". Even news of a sudden family illness at a time when Mark was almost at the furthest point on the globe could not persuade him to be flown home in the dreaded Concorde. Rome came next with, at first the official title of Her Majesty's Envoy Extraordinary and Minister Plenipotentiary to the Holy See , and later as the first UK Ambassador .With Mark and Margaret's love of this city, its culture , treasures and people, this posting was a huge delight. Their hospitality was legendary. How many of us here today were fortunate enough to enjoy the pleasures of the Villa Drusiana on the Old Appian Way and the lovely garden they created there within the ancient 5th Century city walls. Each day Mark would offer transport to his office in the Via Condotti where he enjoyed a fabulous view from his desk of the Spanish Steps, Byron's house and the church of Santa Maria in Coeli. Transport was in the chauffeur-driven bullet-proof Daimler, at least Mark's part was bullet proof. He would remark dryly that he supposed the Italian government felt that ambassadors were harder to replace than drivers. This vehicle known privately as "hell on wheels" had replaced the great favourite, a discreet green eight-year-old XJ6. The reason for this was that a service bill of £800 had rung alarm bells at the Foreign Office Ministry of works who felt that a replacement was essential. However the only vehicle that met their specification was this £40.000 full length bullet-proof black limousine. There were lovely week-end outings to the Villa Adriana, to Tivoli and Ninfa, and guests were able to share some of Mark and Margaret's experiences at important services in St Peters with all the catholic Papal majesty., to which Mark with his stature and elegance made a considerable and memorable contribution. It was an exciting time with the first Polish Pope, the pioneering steps in ecumenism, and a highly successful Royal visit, not least because of Margaret's attention to detail. It culminated in Mark's knighthood in the drawing room after lunch. Mark with his love of ecclesiastical tradition and admirable diplomacy was very much at home in the post. At this time a friend of mine sat next to Mark at a dinner. Enquiring of him the location of his posting, he began to talk about Finland. Mark listened until a suitable pause arose, when he leaned closer and said gently not Helsinkee, "Holy See". In truth Mark was not always polite and he had a salty side. Privately all his cars were fitted with "tack ejectors", these to be used against Rome's worst drivers. At any example of bad motoring Mark would shout ""Fire the tack Ejector" to the amusement of his family; To the over-polite driver who would give way to every-one there would be a mutter of " Sir Galahad ". One evening Mark returned to the Villa Drusiana clutching carefully a brown paper bag which seemed to be alive. He went straight to the garden and, watched by his family, proceeded to extract from the bag two beautiful tortoises. Mark, from his office window, had spotted a gipsy selling these and had slipped out to make the purchase. One hopes they are still enjoying their freedom in the garden today. Finally, after retirement from the Diplomatic service came the appointment to Hong Kong, as Head of Protocol, another exciting job at a time of imminent change in that colony. Sir Edward Youde, the Governor, was an old friend of Mark's, and his sudden death in office was a huge sadness. To Mark fell the duty of organising all the funeral arrangements. 35.000 people queued to show their respects to this hugely popular and well-loved Governor. This appointment allowed Mark to indulge in another of his interests, collecting porcelain, and he added to a fine collection that had been started by his Mother, with an eye for Lowestoft. He was perfectly placed in Hong Kong to hunt for Chinese blue and white ware, for Celadon and Sung. And so to 17 years of retirement. Mark had dreamed of perhaps returning to Budleigh Salterton where his Mother had taken a house during the war and where he held happy memories. But their final choice was here in Bath. A very happy choice of city. Retirement but not inactivity. Mark enrolled as a steward here in the Abbey, and, clad in the bright blue gown loved his duties. A visit to the Abbey with Mark as guide was a memorable experience. As a staunch and some would say old fashioned Anglican, this parish church with a sense of tradition in the services brought him real pleasure. Margaret and he became involved in the Ammerdown ecumenical centre for religious communication and dialogue at Radstock, and Mark retained his Rome contacts as chairman of the English friends of the Anglican centre for a further few years. There was time to enjoy his large library of both antiquarian and more recent books, and to sit in his garden, like a cat in the sun, on his favourite seat. He had always enjoyed a simple life, hating extravagance or waste and would collect the windfall apples to stew. Friends and family would visit and he would visit them. There was time to travel for pure pleasure, and to make new friends on Mediterranean cruises. Mark never complained of his increasing frailty and was enormously grateful for the care and attention that Margaret and other helpers gave him, and to the end showed unfailing courtesy and gratitude to those who nursed him through his short final illness. He had no fear of death .He was ready and felt that the Almighty was calling him. His concern was for the upset this might cause to his nearest and dearest. Mark cared deeply for those who worked with him and always ensured their well-being whatever the circumstances. This (large) congregation bears witness to the many who held him in high regard, to those who number themselves as friends, and to all who loved him and will remember him with great affection. Obituary in the Telegraph 15 October 2005. Sir Mark Heath, who has died aged 78, played a small but significant role in diplomatic history when, in 1982, he became Britain's first fully-fledged Ambassador to the Holy See. Full diplomatic relations had not exisited since Henry VIII broke with Rome in 1534 over his divorce from Catherine of Aragon. After that, relations were conducted, if at all, at a lower level; and when first appointed as Britain's representative to the Vatican in 1980, Heath was simply Minister at the Holy See without ambassadorial rank. The decision to elevate relations to ambassadorial level preceded the visit by Pope John Paul II to Britain in May 1982. The move was welcomed by British Catholics, and Heath's appointment to the ambassadorship was mirrored in Britain by the promotion of Archbishop Bruno Heim from Apostolic Delegate to Apostolic Pro-Nuncio. The ambassadorship was regarded as a plum posting in the Foreign Office, not only because of the attractions of life in Rome (where Heath commuted through the narrow medieval streets between his home on the Via Appia Antica to the Embassy on the Piazza di Spagna in a huge chauffeur-driven Daimler), but because the job itself was a joy for anyone with a taste for old-fashioned diplomacy. Margaret Thatcher, whose dim view of the Foreign Office was well known, often conducted her own diplomatic relations, by-passing official channels by going direct to political leaders in the countries concerned. The Vatican was the one posting where this was not possible. Yet it was essential to maintain good and active relations with the Papacy, particularly on the sensitive issue of Northern Ireland, and this was a job to which the intelligent, courteous and ecumenical Heath was ideally suited. Mark Evelyn Heath was born at Emsworth, Hampshire, on May 27 1927 into a naval family and was educated at Marlborough and at Queens' College, Cambridge, where he read History. After National Service in the RNVR, serving on minesweepers around the British coast, he joined the Diplomatic Service in 1950. Before his appointment to the Vatican, Heath held postings in Indonesia, Denmark, Bulgaria and Canada, and later as Britain's number two with the OECD in Paris. Of these, Bulgaria was his most testing and difficult posting. Diplomats working at the small British legation in Sofia were targets of constant surveillance by the Bulgarian secret police, who were always trying to suborn or entrap younger members of staff. Yet during the 1960s, when Heath served as Head of Chancery (number two), morale among British diplomatic service staff and their families remained remarkably high. The principal reason, according to those who worked there, was Heath's unstuffy and gently boisterous personality and his concern for the welfare of his staff. He was a man about whom affectionate stories were often told, and his unusual height (he stood 6 ft 8 in tall) sometimes got him into awkward situations. One of his colleagues specialised in doing an imitation of Heath getting into the Mini which he drove round Sofia, a procedure that involved elaborate gymnastic contortions. When the Soviet leader Nikita Khrushchev arrived in Sofia for a visit, he was so impressed by Heath's stature (made even taller by diplomatic hat and feathers) that he picked him out of the line of uniformed foreign diplomats waiting to greet him at the airport. To Heath's amazement, and to the consternation of his colleagues, the diminutive Russian strode over and clutched Heath's lower abdomen in a bear-like hug, exclaiming that he would have made an excellent Communist. The British and other Nato embassies and legations had to make their own entertainment, and Heath and his wife Margaret (who is remembered playing a particularly mean Lady Macbeth) were always in the forefront of such activities. Heath took younger colleagues on skiing expeditions in the Bulgarian mountains and was a vigorous exponent of Scottish country dancing. On one formal occasion, he leaped up a little too enthusiastically during a reel and gashed his head badly on a Bulgarian chandelier. As blood poured from the wound, a footman rushed up with water and bandages, but was unable to reach his head. Heath refused to sit down and have a fuss made, so the Bulgarian had to stand on a chair. After leaving the Vatican in 1985, Heath's final posting was as head of protocol in the Hong Kong Government. In this role he was in charge of consular staff and responsible for making the arrangements for visits to the colony by foreign heads of state. In 1986 the popular Governor of Hong Kong, Sir Edward Youde, suffered a fatal heart attack on a visit to Beijing, becoming the first Hong Kong Governor to die in office. Heath was in charge of arrangements for the funeral and achieved a perfect combination of formal ceremonial and personal tribute. More than 35,000 Hong Kong people from all walks of life queued up to pay their respects in an unprecedented display of grief. Heath was a committed Anglican. In Bulgaria, he often led religious services, and it was a particular joy to him that his appointment as Ambassador to the Holy See excited hardly a murmur of protest from Protestants in Britain. 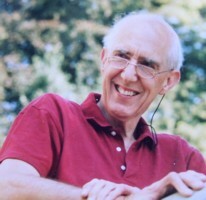 From 1984 to 1990 he was chairman of the Friends of the Anglican Centre in Rome and, during his retirement, he served as a steward at Bath Abbey. He also enjoyed many visits to the Ammerdown Centre at Radstock, a centre for religious reconciliation and dialogue where his wife worked as a volunteer librarian. 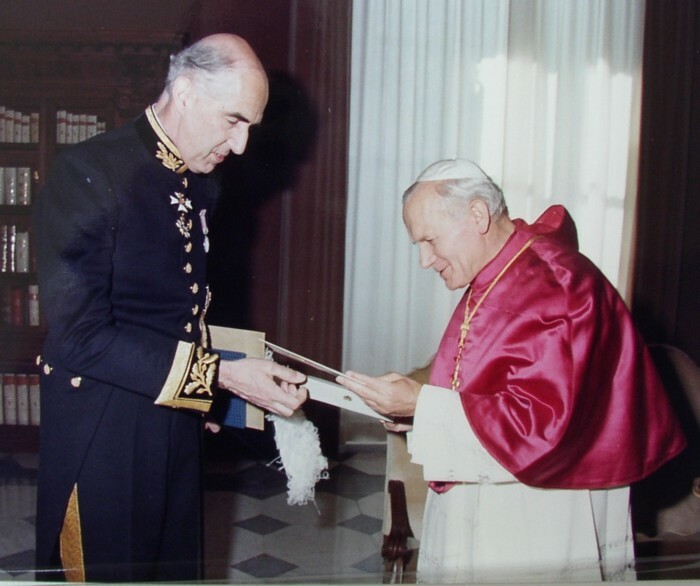 He was appointed CMG on his appointment as Minister to the Holy See in 1980 and then KCVO on the occasion of the Queen's visit the same year. Mark Heath, who died on September 28, enjoyed collecting Chinese porcelain and books, but his main interest was his family, to whom he was devoted. 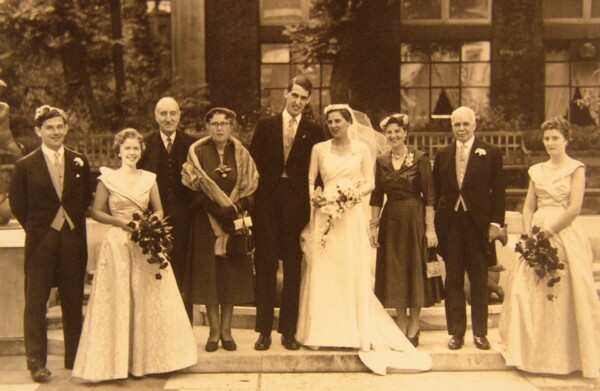 He married, in 1954, Margaret Bragg, the daughter of the physicist and Nobel-prizewinner Sir Lawrence Bragg. She survives him with their daughter and two sons. An obituary written by Mark's cousin, John Heath, was also published in the Independent 15 November 2005.